Enrique Oviedo is a 12 year old from Bristow, VA who has Down syndrome. Enrique has intellectual disabilities and a very limited vocabulary. Enrique has had trouble responding to the available communication devices available at his school and has been mostly sedentary at home and shown little interest in academic activity. With the help of a therapist, Enrique has been introduced and learned to use an iPad. Twenty six year-old Vincent of Woodbridge, VA had a life changing moment at his most recent assistive technology evaluation last winter when he was given an opportunity to use an iPad. Vincent, who has autism, intellectual disabilities and apraxia of speech, is difficult to understand when he speaks. “Vincent is a very loving and happy young man,” says his mom Theresa, “but he becomes frustrated and upset when people can’t understand him.”Theresa went on to describe his reaction to test driving the iPad at his last AT evaluation. “He was able to clearly express his feelings and was so very happy to be able to communicate with me and the instructor.” Vincent works 5 days a week at a workshop, but is very motivated to become more independent. Now that he can communicate his thoughts and feelings, we are certain that he is on his way! The Eric Fund was pleased to help 21 year-old Brittany Lea Landers of Stafford, VA with the purchase of a Dragon Naturally Speaking 11 and a wireless headset. 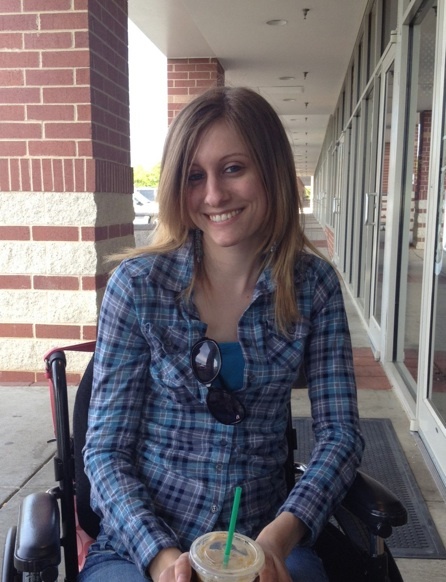 Brittany, who has quadriplegia, will use the device to help her with her college work. The device works by converting the spoken word into typed print. “It will help me type [web addresses] so I can use the internet,” Brittany said. “And it will help write my college English papers so I can get an English degree and become a teacher.” With a little help from the Eric Fund, we know that Brittany will achieve this goal of living a more independent life. Alex Martin, 19, of Rockville, MD is a talented young artist with autism who is unable to speak and reads at a first-grade level. Alex will use his new iPad in school to learn new design programs and improve his computer skills. The iPad will help him communicate and the Edmark Software II that The Eric Fund is providing will help him improve his reading. Alex enjoys communicating through his art and even created his own small business, Alex’s Art Loft, www.alexartloft.org where he sells his cards and other multimedia creations. He donates much of the proceeds from his sales to a variety of non-profit causes. Alex’s Mom, Diana told us that he is thrilled and can’t wait to get started on his new equipment. Connie Armstead, 56, of Ruby, VA is deaf and communicates in American Sign Language. The Eric Fund partnered with Project Endeavor, a non-profit organization that provides low cost equipment to deaf people, to purchase an iPad for Connie. With the iPad, Connie will be able to access a videophone that allows her to talk to friends, family and make appointments with doctors and potential employers. Because of the iPad’s mobility, Connie will now have similar advantages as a hearing person using a cell phone. She told us that she is a proud grandma to two grandsons and loves to play bingo! Randolph Kendrick, Jr., of Warrenton, VA is 22 years old and has multiple disabilities including autism, blindness, developmental disabilities and epileptic seizure disorder. His life took a downward turn when he finished school and no longer had access to the assistive technology that he used while he was there to communicate his wants and needs. His inability to communicate verbally greatly increases his stress and frustration. According to his mother, Theresa, the iPad, which Randolph will be receiving from the Eric Fund, “helps us to understand when given choices, what he would like to eat, drink, listen to or watch. It is truly life changing for him and for those of us who love him.” Randy was set to begin more intensive physical therapy in the summer to work on his speech, among other things. With the addition of his iPad, his progress is sure to be much faster ... and more fun!